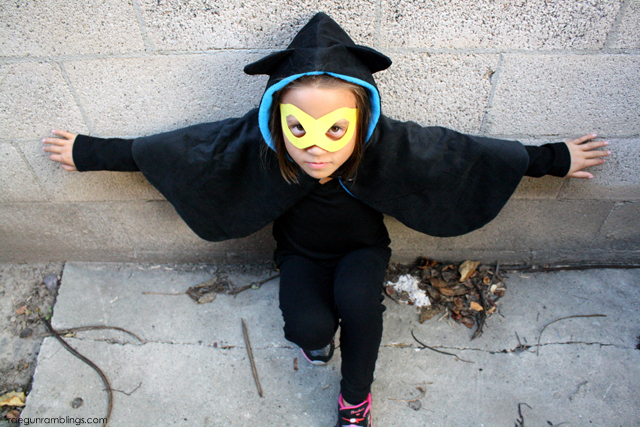 We are all about Super Heroes in our family so when I was invited to join in on the Amelie Cape Pattern Tour I knew I wanted to Bat Girl-ify the pattern. The pattern is SO quick and easy even with the extra steps of my tweaks to add the ears and bat wing lining this came together in less than an hour start to finish! 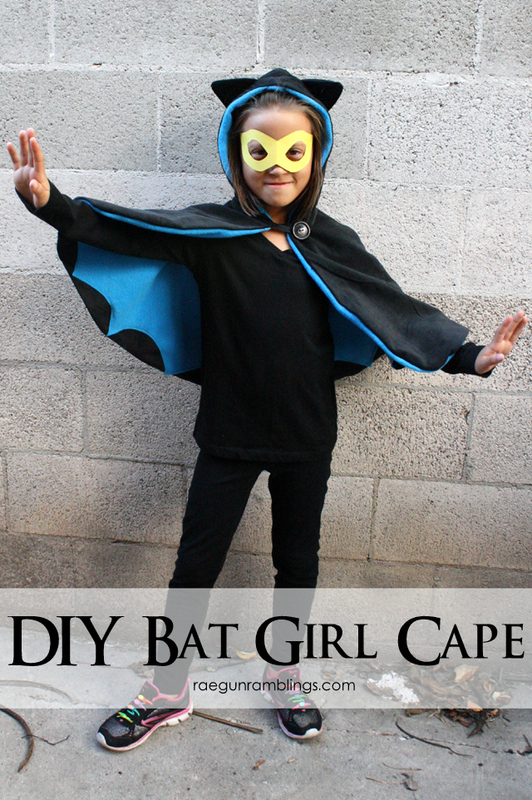 So today I’m going to show you how to make a quick and easy Bat Girl Cape using the Amelie pattern. The pattern comes with an option of a darling Peter Pan collar or the hood like I did. It has two sizes 1-3 years old and 2-6 but T is already 7 and almost in 8 year old clothes and it still works wonderfully for her. 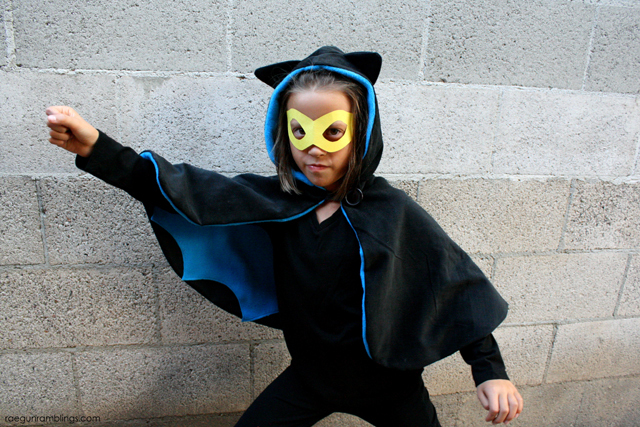 The pattern is just 6$ so that’s way easier than trying to finagle your own cape. Follow the directions to cut out the cape pieces. When you have the lining cut out. cut some small curves out of the bottom edge to make bat wing shapes. 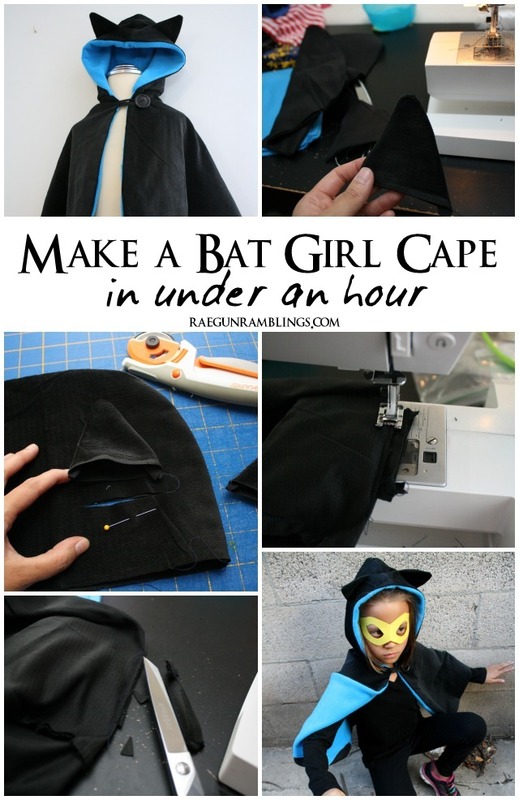 Next lay your cape on top of your bottom lining fabric and cut a piece out to complete what you just cut out. Basically you’re putting the lining back together so that it is the same shape as the outer piece. Pin the wing piece on top of the bottom lining and sew down. Since it’s fleece you don’t need to finish the edges. Now the lining piece should be the same size as the outer cape piece. Next sew the outer fabric hood pieces together as directed. Cut 4 triangle pieces out to form ears. With right sides together sew two triangles to each other. Repeat with the other pieces. Turn right side out and iron. Try your hood on and mark where you think the ears should go. lay the hood piece on your cutting table with wrong sides together. Position the ears and make a slit using a rotary cutter just a tin bit bigger than the edge of the ear. You want the slit to go through both sides so they are positioned evenly. Slide an ear piece into each hole and pin. Fold over and sew closed catching the two hood layers and the ear layers. Trim off any ear pieces sticking out on the underside of the hood. This is the same method I used to make Teddy’s Bear Hooded vest. Now continue putting the cape together as directed in the pattern. So easy right? I love how it turned out. 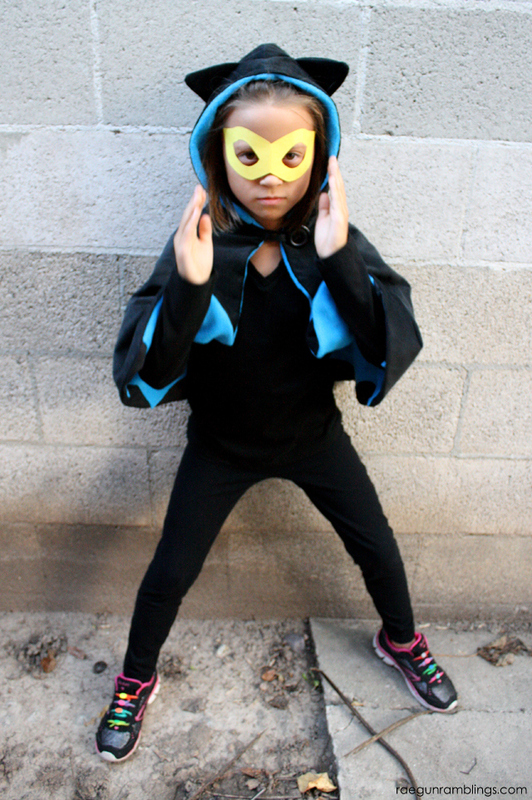 All you need to do is add a super hero mask to protect your secret identity and you’re good to go! I think you could totally do the same thing to make a cat cape too! I tried to suggest to T that it could also be a Cat Woman cape if you ignored the bat wings inside but she was horrified at the thought of being a bad guy. Of course my husband had to remind her that she didn’t feel so strongly about being a bad guy when she wanted her Dark Phoenix Costume though. Ha! 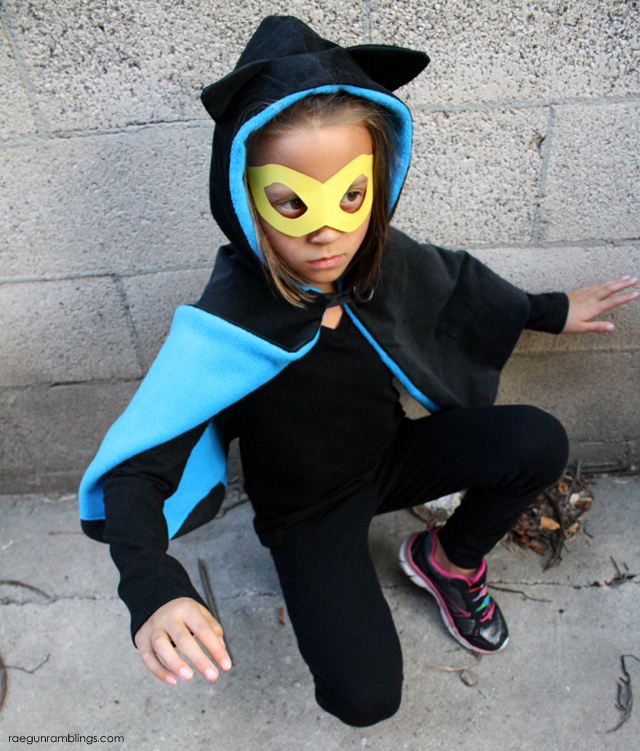 To see other versions of the cape hop on over to Amelie & Atticus and check out or buy the cape pattern here.